Cappanalea Outdoor Education and Training Centre on behalf of Kerry ETB are running an adventure expedition for Senior Cycle students throughout our schools and Centres in Kerry. 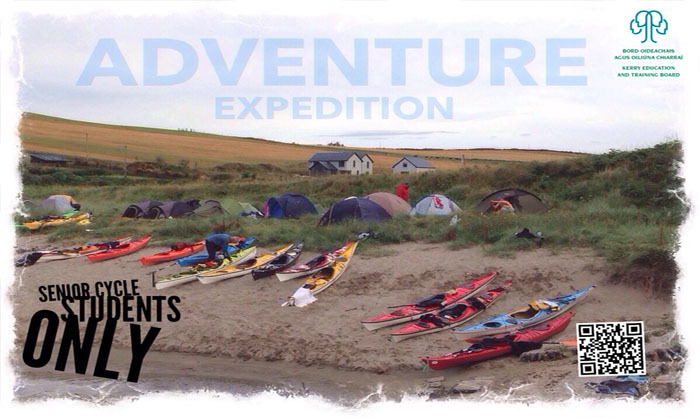 This expedition will be part of the Kerry Active School Programme. The expedition is open to students, who are involved in the PE programme. The expedition will run over the Easter break, from Monday 8th – Friday 12th April 2019. Wilderness expeditioning and remote camping creates an indelible impression in the minds of young people. Here in Kerry we have a strong and rich tradition of expeditioning and a unique wilderness environment which lends itself to outdoor adventure. The expertise in Cappanalea and throughout the county could be harnessed to expedite this educational and adventure initiative. Invitations are being extended to all our Kerry ETB schools and Centres who are involved in the Kerry Active School Programme. We will be seeking nominations to form a mixed group of young Kerry ETB students. These students will be selected on an agreed criteria set by the PE teachers, which could include; attendance; achievement; participation; improvement; possible benefits to those involved etc. The group of ten or twelve students, aged 15 to 17 years old, will be invited to engage in the Adventure Expedition of outdoor sporting and cultural activity on a five day self contained wilderness journey. Students along with two instructors from Cappanalea OETC, would pack and carry everything necessary for 4 nights camping and undertake projects and compile journals as a means of recording the expedition. PE teachers would be welcomed to participate in some or all of the expedition. In the inaugural year of the expedition it is planned that it will be based in Kerry. The programme of activities will include sea kayaking; camping, hiking and rock climbing. TAKE THE NEXT STEP – If you are a Senior Cycle Students and are interested in joining this Adventure Expedition, you are invited to submit a letter / email expression your interest in the expedition and the benefits which your involvement will bring to the adventure. Please make sure to identify your school or centre and your year group in your letter or email.